Obama offered to pick up the tab for a group of journalists - an offer few would make. 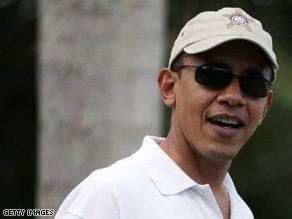 HONOLULU (CNN) - Many Republicans already believe President-elect Barack Obama has gotten a free ride from the national media, so they may not be happy to learn the incoming Commander-in-Chief offered to buy a round of drinks for reporters covering his working vacation on the sands of Hawaii's beaches and the greens of its lush golf courses. Halfway through a round of golf on Sunday afternoon, Obama rolled up to the snack bar in his golf cart to find a small pool of reporters waiting to get more pictures of him enjoying a leisurely day. No doubt realizing these might not be the best images at a time of recession, Obama suggested the reporters seek some other recreation to pass the time - rather than snapping so many pics. "Obama then told us we should be in the clubhouse at the bar having some beers," according to a pool report by Jamie Farnsworth of CBS News. "Someone asked if he would pick up the tab and he agreed before driving off to the next hole. Pool is still holding without beer. In a separate pool report for print journalists, Jeff Zeleny of The New York Times added helpfully: "He chatted for a moment, telling the pool to have a beer and put it on his tab. No one took him up on the offer." Aha! So the key here is reporters covering the President-elect are having more fun here in Hawaii than we had in Crawford, Texas - and 85 degrees in the middle of the afternoon here is way better than the cold winds blowing through Chicago too. But none of the journalists were corrupted by free beer - we pay our own tabs. And just for the record: your faithful correspondent, while enjoying the wonders of Waikiki beach, never drinks - at least not on the job. I remember that Bush was on vacation 41% of the time from 1/20/01 to 9/11/01, but the economy had not been destroyed at that time as it is now. Why do I believe Obama is going to be one of the most crooked Presidents ever? The economy is horrible and he's out on vacation smoking and drinking and buying the press. Wow, great example. Already starting... not that he offered to buy the people drinks it is the reference to put them on his tab, that I am sure someone else is paying. I hope I am wrong, but with all the friends he has filled his cabinet with, that have significant ties to IL Governor he needs to watch everything he does. Given the following options, I'd pick Obama and Beer. 1. A President who keeps reading children's books while the country is under attack. 3. A President who stays on vacation while an American city drowns. 4. The President-elect golfing in Hawaii a couple of days before Christmas. It's Obama showing his African roots. We are used to treating each other with one beer or two. What's wrong with this? I know most Americans are mean; they'd not even buy you a plain burger. And which journalist would accept to be corrupted with beer? These journalists must be very cheap and weak? OMG!!! I can't believe some of these comments. I kept seeing, "The media got Obama elected." What a croc of sour grapes that is. I voted for Mr Obama. I donated money to his campaign. I worried and watched the entire election. I am not a member of the media. I listened throughout the election to the Republicans talk endless smack about my candidate. But guess what everyone, Obama won! You can spout wingnut right-wing conspiracy theories about why you lost all you want but guess what? Obama won! Obama Won! Obama Won! Obama Won! Obama Won! Obama Won! Are you getting it yet? If not read these 3 lines over and over again until it sinks in. GET – OVER – IT!!!!!! If Im not mistaken, there is a quadrillion-dollar war going on, the economy is on the ocean floor, and we are discussing the President-elect, who is a man offering to buy loser-paparazzi types a drink so that he can enjoy his vacation. GET REAL AMERICA...Lets talk about the quadrillions of dollars that Haliburton and Shaw Group are making from this war...How many beers would that buy? From poster Adrian: We have comments like "lighten up", "that was decent of him", "its the holidays"…. Let me tell you how this fake holiday is a great excuse to get drunk and forget about our problems. Yay!!! lets celebrate Jesus, when we are so far from Him, on a day He was never born, and do all the things He is against. … WHAT A HOLIDAY…!!!!! You need to lighten up for real. I buy people a round of drinks all the time. One round should not intoxicate you (it's a drink). While the Jesus statement is correct, don't chastise people for enjoying themselves. If you had his money, you wouldn't buy me a beer? Christian huh? Yes, how dare he spend American money in America while on vacation and help the economy? This is a recession! Everyone should sit at home and not spend any money during the holidays, so the economy can magically fix itself. Oh for Pete's sake. The man went home for the holidays like every other president. Let's not forget he missed his grandmother's death due to election day being so close. He's there to spend time with family (some who still live there) and gain some peace about his loss. Not to mention that in the past they have spent several holidays there with family. He's just doing what he's always done but his childhood home just happens to have great golf and beautiful beaches. The only thing I'm upset about is that he didn't take me with him! 😉 I lived there for 13 years and miss it so. Try a spam musubi sometime. They're great. Typical CNN story. Trying to make up an issue when there is none. Flogged the Blago story to death despite the strong evidence that there was no wrong doing. No surprise CNN would flogg this non-story. The "best political team in television"? Not even close. I have completely stopped watching CNN, the website is next.